Did I mention that I bought a couple of new cookbooks recently? Oh dear, how many cookbooks can one have before one has too many? A few more to go, I think. Two of my recent acquisitions were purchased in an endeavour to learn more about tempering chocolate. Even though I have had some success, I still don’t feel like I have conquered this home tempering business. I am still on a very steep learning curve. Maus and I are munching our way through my attempts. One of the books I bought was Chocolates and Confections by Peter Greweling. It is a book by the Culinary Institute of America. And I must say, it is a fab book. There are a few ingredients that aren’t readily available in Australia but nothing you can’t substitute or make yourself. Virtually every recipe includes corn syrup which, as far as I can tell, is not available here. What is readily available is glucose syrup (which is derived from corn). The brand is Queen and Woolworths and Coles both sell it. I got mine from Woolworths. It is in the section where the icing accessories are sold. If you go to Queen’s website, they tell you that you can substitute it ‘one for one’ in recipes that call for corn syrup. Interestingly, my book notes that corn syrup is one of the most widespread food ingredients in America. And it is not available in Australia! How weird is that? The book goes on to advise that ‘glucose syrup, a specialty type of corn syrup available to professionals is not used in the book.’ Clearly, it is not readily available in America but it is freely available here. Don’t you just love it? Anyway, back to the job at hand. 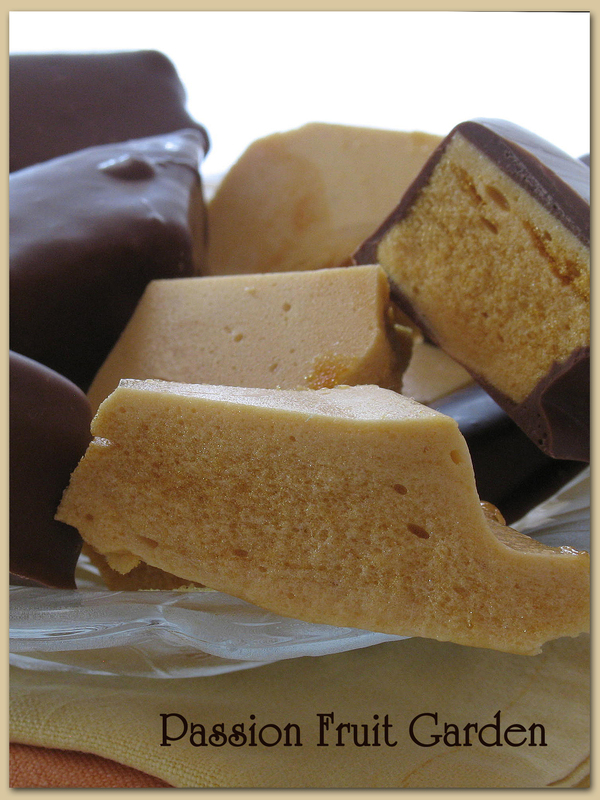 I made the honeycomb (or sponge candy as it called in the States) and it was fabulous. Better than any commercial honeycomb I have tasted and it was pretty easy to make. 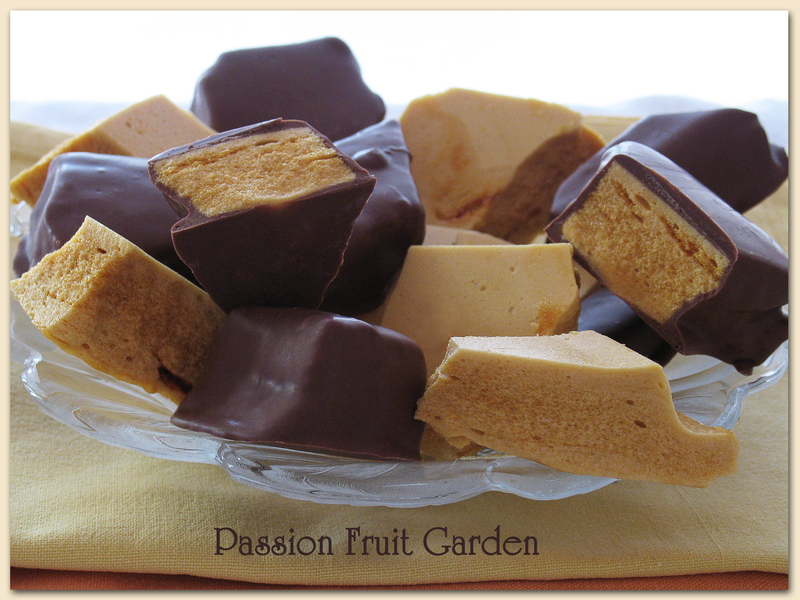 The book rates each recipe by its difficulty, honeycomb was ranked one. That is a good place to start. The recipe is in ounces and pounds. I have converted the weights to grams for those who don’t have ounces/pounds scales. Luckily, mine can be switched between the two measurements. To make this recipe, and any other sweets, you will need digital scales and a good candy thermometer. Temperatures are critical, and it is important you measure your ingredients carefully. Grease a 9 x 13 inch (23cm x 33cm) baking tray with butter. Dust it with flour then shake out the excess flour. Mix the gelatine with the cold water in a small bowl. Set aside. Combine the sugar, corn syrup (glucose syrup) and water in a 4 litre saucepan. Stir to dissolve the sugar then stop stirring and bring to the boil. Cover the saucepan and allow it to boil for 4 minutes. Add the honey, and continue cooking until the syrup reaches 310°F (154°C). Remove the saucepan from the heat and allow to sit, undisturbed, until the bubbling stops, about 2 minutes. Whisk in the rehydrated gelatine, making sure it is mixed in well. Whisk in the bi-carb soda. Whisk vigorously to thoroughly incorporate. Return the pot to the heat and whisk over the heat for 30 seconds. The mixture will foam up. Pour immediately into the prepared baking tray. Don’t use a plastic or silicon spatula to get the mixture out as it is very hot and it may melt them. Use metal or wood. Leave undisturbed to cool at room temperature for, at least, 2 hours. Invert the tray and tap out the honeycomb – it does come out. Break it into pieces using a big knife, cleaver or small hammer. Store in an air tight container or, if desired, coat in tempered chocolate. If tempering chocolate is out of your league, coat the pieces in compound chocolate. Compound chocolate is not real chocolate as it is made with vegetable fat (more often than not, palm oil) rather than cocoa butter. The big advantage of compound chocolate is that it does not need to be tempered as it sets at room temperature. All you have to do is melt it and dip the honeycomb in it. Trust me, the kids won’t mind if you use compound chocolate. I tempered my chocolate. The first half turned out fine (they are the ones in the photo). The second half was streaky (my trusty book shows a photo of streaky chocolate and describes it as ‘incorrectly tempered‘). Notwithstanding this, they all set hard at room temperature so all was not lost and Maus (who loves me dearly) quickly ate all the streaky ones so I couldn’t see them and get upset about my tempering (or lack of) skills. This entry was posted in Sweet Things, Treats/chocolate and tagged Homemade Crunchie, Homemade Viotet Crumble, Sponge candy by Glenda. Bookmark the permalink. G, I just realised I have this book – I was trying to make painted chocolate from it yesterday and had a tempering fail! Nevermind, live and learn. Agree that it’s a fabulous text, lots of interesting things in there! Interesting about the glucose syrup and it’s availability only to pro’s. I rarely use corn syrup but have always had a bottle on hand as a staple…should probably check that expiration date since it could now be some other alien substance by now. These do look great though and remind me of something we used to have when I was a kid. I think the ‘correct’ number of cookbooks is 57 or maybe it’s when the shelf starts to bow. Hi Diane, I am sure your corn syrup would be fine. It would last forever wouldn’t it? I have been amazed at all the comments I have received about how we don’t want corn syrup in Australia. It must be a touchy issue. I didn’t even know that sugar was produced from anything other than sugar cane. From what I read the states have high tariffs on sugar made from sugar cane so it is made from sugar beet. Only 57! On no, I am in big trouble! I have many, many, many more than that! I learned more about sugar from your post than I ever knew before – I thought ours came from sugar cane but it could be that was back in the day when we imported from Cuba (hey, I could be making that up though). More than 57? Have you got good supports under those shelves? I searched by local deli -the one in Bicton and they have Karo brand corn syrup for sale – light or dark (?). It looks like a US import but is available. Thanks Colette, See you on the weekend. Hi Celia, I did read, that it was available in health food shops(though, I have never seen it). Can you believe it? Bizarre!! I am happy with Queen brand glucose syrup. We may all be getting a wee bit excited. Honeycomb has never been a health food 🙂 Sugar is pretty bad for us no matter how you look at it. Home made violet crumbles were a favorite when I was a kid. I think the recipe came from a Womens Weekly cookbook (where else!). This is the closest I could find http://www.bestrecipes.com.au/recipe/honeycomb-L4387.html – it uses white sugar, honey and golden syrup. I agree, let’s keep high fructose corn syrup and beet sugar out of Australia, and the integrity in our own sugar producing industry. Less is more. Hi Ella As I said elsewhere I had not even heard of sugar beets two days ago and have never seen corn syrup on sale in Perth. I was watching Foreign Correspondent last night on the ABC. It was about the minimum wage in New Jersey. The interviewer was interviewing a young single mum. They went to a diner for a meal and I was amazed when she poured corn syrup on her dinner. They sure like it sweet in the States. I had half an eye on Foreign Correspondent and the New Jersey program also while I was cooking dinner. It was an eye opener in more ways than one. I think it’s not what’s going on the food that people have issues with, it’s what it food is, or isn’t. Michael Pollan’s In Defense of Food tells the story. It would be a terrible thing for Australia to go the same way. This looks a more controlled version than I make! And I don’t temper chocolate beautifully like you do. I don’t know if we have corn syrup – I use golden syrup for honeycomb. I think all the Australian recipes do too Anne. This has the same flavour as commercial honeycomb so maybe the commercial recipe doesn’t use golden syrup. It is all very confusing. I am going to try another version soon. This looks so good! i love that you covered some in chocolate, i bet those taste amazing, streaky or not! I think we all need a tempering lesson from Celia. Indeed, I think we do!! De-licious! And well done for tempering your chocolate. It’s on my list of things to try, along with making my own pasta. So it’s encouraging to read about those that are brave to do it – it really is encouraging reading. And I had no idea honeycomb was easy! You don’t need corn syrup, although it is actually quite widely available these days. Most IGA supermarkets and lots of Farmer Jacks have it, and even some Woolworths. Glucose- this is usually highly concentrated and therefore thick, and will probably need diluting to the correct consistency. Golden Syrup- the genuine article is a pure cane sugar syrup with a light golden colour, which means you don’t need to add honey. Imitation Golden Syrup- this is made of a cheaper invert sugar syrup with added flavouring and colour. Drawback- tastes and smells like fake golden syrup. Ooo, these look fabulous! Hmm, I need to see if I can get corn syrup here. Think I may have seen it at baking stores but can’t be sure. What I remember seeing was a clear white syrup in jars. Hi Mandy, In Australia, we use glucose syrup, which I gather is only available to professionals in the States. You may find glucose syrup to be freely available in SA. It is clear. Here in the U.S., corn syrup finds its way into almost every processed food on the market – and it has become one of the most hated of all ingredients available – I am among those who share that sentiment. Perhaps the wiser among your nation’s food police have noted the mistakes we have made and determined not to follow suit. Hi Doc, I think you are right. There must be a reason why it is not available. Hopefully, a good reason. What fascinates me is why glucose syrup is not available in the States. Clearly it is a specialised ingredient but you would think you could get it. From the sounds of my new book, it is only available to professional candy makers. Neither am I well read on this subject, nor do I have a background that makes me knowledgeable, but I do know from my diabetic experiences of trying to find a non offending type of sugar that there is no such thing! and that the world of ‘sugars’ is a very complex one. But my trustworthy source of answers, Wikipedia suggests that in the U.S., the terms glucose syrup and corn syrup are used synonymously (http://en.wikipedia.org/wiki/Corn_syrup). However, that does not make it so, as it seems there are technical differences, and regional differences as well. So, for our purposes, perhaps it is sufficient to assume that they are used interchangeably, and leave it at that. Hey Doc This is all very interesting. I had never even heard of sugar beets until last night. Our sugar comes from sugar cane whereas, it appears, yours comes primarily from sugar beets. I am amazed, it never occurred to me that sugar came from anything but sugar cane! BTW Honeycomb and you would not mix 😦 Too much of all kinds of sugar in that one!! omg I have a sore spot for Crunchie Bars, this post is dangerous, I might make it and then eat it ALL! Hi Lisa, Maus has done a good job eating this lot. She is partial to a bit of honeycomb. Hi Tandy. Great news do you remember what shop it was?